In an amazingly detailed series of windows, scenes of Harry Potter and the Fantastic Beasts films have been reconstructed. One window, based on the Fantastic Beasts bank scene, features a scenically painted layered back drop of the elaborate fret-cut bank tellers screen. In the foreground are various sourced props including a reconditioned desk and lamp. Another window shows a platform from Kings Cross station with faux semi-relief brickwork. Arches were layered on to the main wall structure that completely ran the width of the window. Suitcases and parcels were made and sourced. 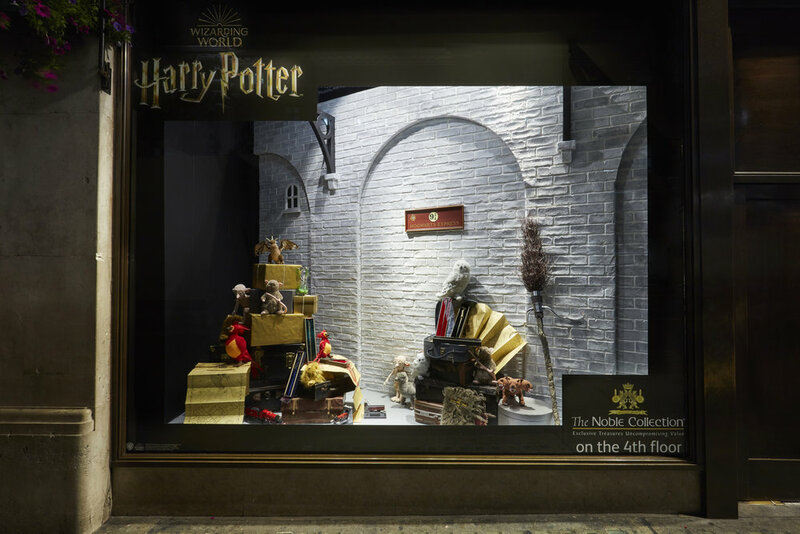 Finally, a large scenically painted cut out of the Hogwarts castle together with hand-strung wands suspended on black wires are featured alongside white plinths at the front of another window showcasing other products from the Harry Potter range in store.